Thousands of people in Northern Ireland have been imprisoned for non-payment of court fines for minor crimes including not having a light on their bicycle, dropping litter and fishing without a licence. Around 2,000 people are sent to jail every year for fine defaulting and they make up around a third of total admissions to our prisons. An investigation by The Detail has examined information released under Freedom of Information relating to over 14,000 cases where people served time behind bars from the start of 2006 until the end of October this year. For each of the 14,259 cases, the Northern Ireland Prison Service has given the gender of the prisoner concerned, their age group, a description of their offence and the balance due on their fine when they were taken into custody. Some individuals may have been in jail for fine default more than once during this time period. The information taken from the Prison Records Management System gives a fascinating insight into the range of crimes which result in prison terms being served. 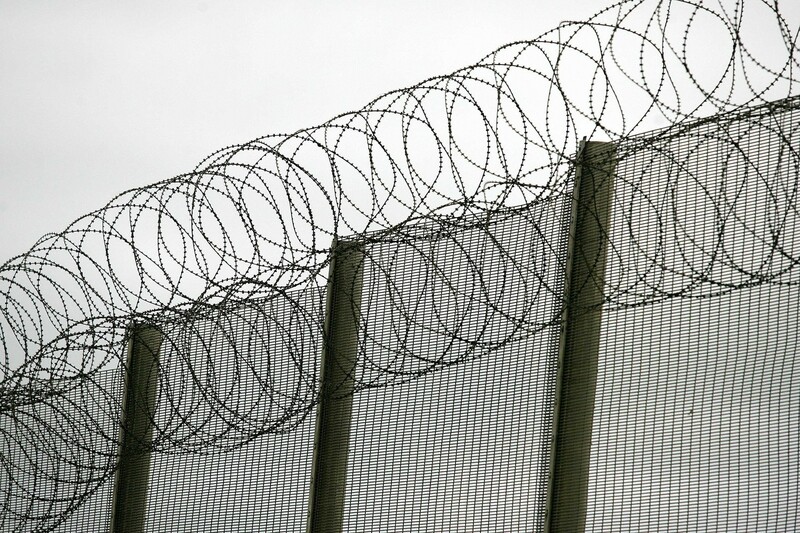 In an article written for The Detail, Niacro’s chief executive Olwen Lyner argues that prison is not a proportionate response to the offences and brands it “unacceptable” that some people can afford to buy their way out of imprisonment. The Criminal Justice Inspectorate has also spoken out strongly. Chief Inspector Dr Michael Maguire said: “The number of fine defaulters in prison is simply unacceptable, does nothing to address the needs of offenders or society and makes the prisons much more difficult to run." 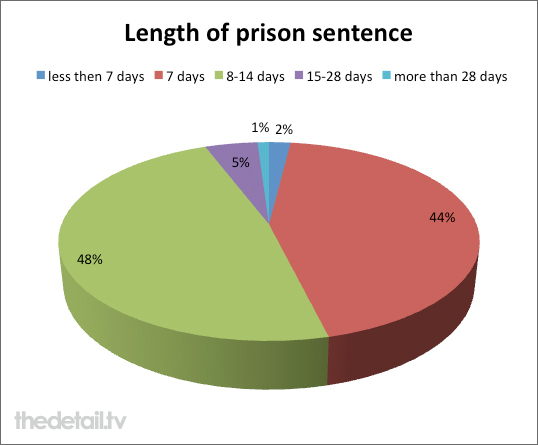 An analysis of the six years of data by The Detail found that 89% of the people imprisoned had unpaid fines of £500 or less and 92% of the sentences given were between seven and fourteen days. Fine default prisoners typically serve a third of their sentence. It has been estimated that it costs £3,000 for a four-day committal of a prisoner. 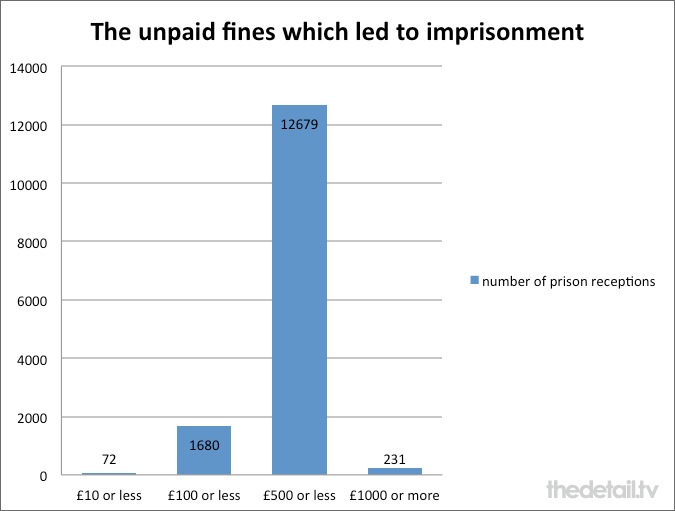 All of the 14,259 fines came to a total of £4.8m and these are written off when the sentence is served. 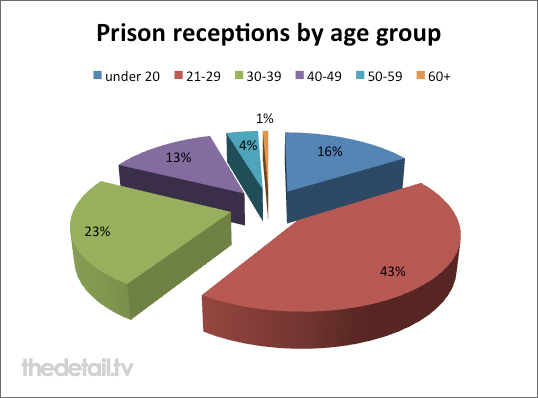 Of those imprisoned, 962 were women and 97 people were aged over 60. The largest unpaid fine was £500,000 for evading customs duty on goods and the lowest were three fines of £1. The Department of Justice said that 23 fines recorded as zero were an “input error” in the data. People have spent time behind bars for non-payment of fines for begging, not paying TV licences, having a child in a car without a seatbelt, fishing without a licence, failing to wear a seatbelt, overtaking on the inside and not paying a shoplifting fine of just £6.89. Three people were jailed for failing to pay fines for allowing children to be absent from school. Their fines ranged from £165 to £755 and their sentences were between seven and twenty-eight days long. Almost half of all of the cases involved people jailed for motoring offences – over 4,600 did not have insurance. Other motoring offence descriptions included ‘dangerous cycling’, ‘driver unable to have full view of road’, jaywalking, ‘learner driver on motorway’, ‘parked within 15m of junction’ and ‘unlawful use of lamp’. The largest unpaid motoring fine was £5,005 for misuse of trade plates. This resulted in a man aged over 60 being sentenced to 92 days in jail. The longest sentence for a motoring offence was 250 days for a man in his 30s who hadn’t paid a £14 fine for using a car without insurance. Non-payment of fines for not having a TV licence resulted in 728 people starting a custodial sentence. Eight people were imprisoned for litter fines – four women and four men. One of the men, who was in his 20s, was given a 28 day sentence last year for a fine of £937. The four people jailed for not paying fines for begging were all men aged in their 40s or 50s. They were sentenced to seven days for fines ranging from £50 to £105. There appears to be some discrepancy in sentences given for similar crimes. In 2008 man in his 20s was sentenced to 184 days for a £6,847.68 unpaid fine imposed for owning a dangerous dog. While in 2010 a man in his 20s was sentenced to just six days for not paying £5,979.55 for having a dangerous dog. In 2009 a man in his 30s was sentenced to 14 days for failing to pay a £26,025 fine for not having a TV licence. This contrasts with the 28 day sentence given to a woman in her 30s in 2010 for not paying a fine of just £508 for the same offence. And looking at drug offences, a man in his 20s was sentenced to 45 days in 2007 for a £1,500 fine for possession of a class C drug. While in 2008, a man in his 40s sentenced to just seven days for a much larger unpaid fine of £90,607.00 for the same offence. The Department of Justice has confirmed that of the 14,259 fine default prisoners between 2006 and 2011, 8,257 were new committals and 6,002 were already in prison. There is wide consensus on the need for change in how fine defaulters are dealt with. The Department of Justice recently completed public consultation on fine default in Northern Ireland. The responses will be made public next year. This comes just three years after a strategy was established in 2008 by the Northern Ireland Courts and Tribunal Service (NICTS) to alert people to the consequences of default and to provide advice. Court officials now contact and encourage those with fine payment due to make payment – possibly by instalments or even to seek additional time if that is needed. The fine collection scheme has been successful in that it increased the number of fines paid by 30% but it appears not to have addressed the key issue of reducing the number of people ending up in prison. 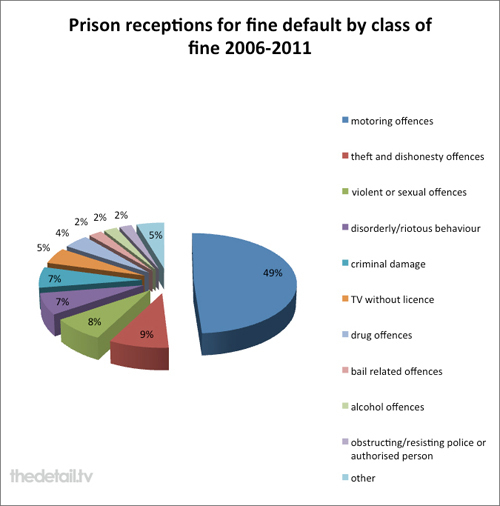 The data released to The Detail shows that 1,169 people were sent to prison for fine default in 2006, 2,494 when the new scheme started in 2008 and this went up to 2,844 in 2011, covering just the 10 months up to the end of October this year. Criminal Justice Inspection Northern Ireland (CJI) published an inspection report on the enforcement of fines in Northern Ireland in March 2010. Chief inspector Dr Michael Maguire told The Detail: “The number of fine defaulters in prison is simply unacceptable, does nothing to address the needs of offenders or society and makes the prisons much more difficult to run. “It does not do anything to deal with the actual problem of people who are either too poor to pay a fine, or who can avoid payment at the further public expense of a couple of days in prison. “There is a need for a stricter regime for the payment of fines to maximise compliance and minimise recourse to police enforcement and imprisonment. “The CJI inspection identified the current system as being open to abuse. Many of the people who go to prison have their fines paid-off were relaxed about it, and were in effect, opting for prison. “If imprisonment did not discharge the fine that would fundamentally change their calculation. The CJI is due to publish a further inspection report on fine enforcement in the New Year. In the meantime, a pilot is due to get underway on January 1st in the Newry area. Unpaid work in the community will be offered as an alternative to being sent to prison for unpaid fines. The Supervised Activity Orders scheme has the support of the Probation Board in Northern Ireland (PBNI). A spokeswoman said: “The only disposal currently available to courts for fine default is custody. “PBNI is of the view that custody should be used for people who have committed a serious offence and the risk they pose to communities, but custody for other crimes, such as non- payment of a fine, should be a last resort. “Supervised Activity Orders, which will require people to do unpaid work in their local communities, give people an opportunity to pay back for both their original offence and non-payment of the fine imposed; it is a way for them to make reparation. “This is a practical way that will help people take responsibility for their behaviour. Depending on the amount of the unpaid fine, people will be required to work for between 10 and 100 hours (available for fines up to £500). “The first pilot of Supervised Activity Orders will commence on 1 January 2012, and run for six months. “PBNI have indicated to the Department of Justice their willingness, providing resources are available, to test out this community alternative for fine defaults in other court areas during 2012. Justice Minister David Ford told The Detail that the number of people going into custody for the non-payment of fines is unsustainable. “It is also at odds with the reformed justice system we are trying to build in Northern Ireland,” he said. The Minister said that the recent consultation process included an examination of powers available in other jurisdictions, including fines officers and powers to deduct monies from income. He continued: “Our next step, in light of the results of the consultation and the views of the Justice Committee, is to prepare and bring forward new legislative powers to the Assembly to create a fine setting system that is effective, efficient and fair."